Profile by Azure Bevington: Northern Mockingbirds, permanent residents in our area, fill the air with song. These thin long-tailed songbirds, often sing 10-15 different songs in succession and can be heard in a variety of open habitats, including backyards. Northern Mockingbirds are not shy and often sing from an open high perch, or can be seen running or hopping across the ground chasing insects. They also will aggressively defend their territory from other birds, people, and even squirrels. While they are primarily grayish, with a lighter underside, the flashy white patches on their wings and outer tail feathers can be easily seen in flight. They also often give a wing display, where the open their wings to show off the white patches. One use of this wing raise is to startle invertebrate prey out of their cryptic hiding spots. Northern Mockingbirds will sing all day and even into the night. Often when you are awoken by a singing mockingbird in the middle of the night it is an unmated male, practicing its expanding repertoire. Night time singing tends to be more common during spring and full moons. They are continually adding new songs. 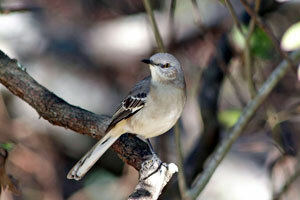 A male mockingbird may learn up to 200 songs throughout its life. The size of a "mockers" repertoire is linked to their breeding success. Both males and females sing, though the females tend to be quieter and rarely sing in the summer. In the past Northern Mockingbirds were often kept in cages and sold as pets in order to have bird songs on demand. Northern Mockingbirds prefer open areas with a number of perches, such as residential yards, parks, and pastures, where they forage on the ground for insects and small lizards. They also eat a wide variety of berries particularly in the winter and spring and have been seen licking sap from recently pruned trees. Planting a variety of fruiting trees and shrubs, such as mulberries and blackberries, as well as avoiding the use of insecticides, will increase the habitat value and attract mockingbirds to your yard.